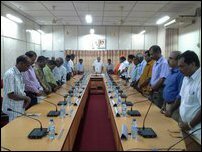 Tamil People’s Council (TPC), a 30-member body launched in Jaffna on 19 December consisting of three-member co-chairs that includes NPC Chief Minister Justice C.V. Wigneswaran, has gained momentum and hype despite the shortcomings in the formation of an institution bringing together political, religious, civil activists and professionals at a critical juncture. The TPC is set to meet on Sunday to discuss the way forward to articulate the Tamil outlook for a political framework in resolving the Tamil national question. Those involved in the move should rise above the average introvert dialectics and conceive the TPC as a platform in articulating the real aspirations of the nation of Eezham Tamils to the outside geo-political ‘conflict managers’, who seek to contain the aspirations of the people, Tamil political observers in the island said. Well-informed sources told TamilNet on Friday that a deviatory section, backed by outside forces, was quite active in trying to hijack even the TPC move. The professionals and academics remain firm on the underlying principles unlike many of the politicians of the TNA legacy and other activists accustomed to NGO influence. However, they should be prepared in coming forward to act as open and transparent voices of the TPC, the informed observers opined. The list published in TPC’s website names 32 participants as involved in the initiative so far. There was no women among them and the representation of Tamil-speaking Muslims was totally absent. 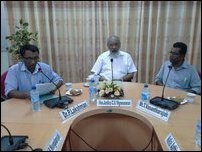 One of the co-chairs of the TPC Mr T. Vasantharajah, when confronted with these questions, told TamilNet on Thursday that the TPC would be evolved taking these criticisms into serious consideration in the forthcoming days. A similar democratic formation was materialized with the grassroot capacities of the incipient ITAK as witnessed in their numerous civil-disobedience campaigns which culminated in the 1961 Satyagraha that mobilized the masses of the North-East into hartals, effectively shutting down Colombo’s administration in the Tamil homeland. What the nation of Eezham Tamils needs at this historical juncture is a grassroots polity that has the ability to contain the deviatory forces through a mass movement and at the same time sharply articulates to “anybody [outside forces] who may intervene to suggest compromise” that the “sovereignty and independence of Tamil Ceylon [the nation of Eezham Tamils] is not negotiable and would brook no compromise,” to quote the wise words of the doyen of Eezham Tamil cause Mr V. Navaratnam. Thanthai S.J.V Chelvanayakam admitted his failure of departing from the policies of V. Navaratnam, the co-founder of the ITAK, and adopted this wise advice 7 years later in giving articulation to the aspiration of Eezham Tamils in 1976 Vaddukkoaddai Resolution. At the same time, the Tamil national leaders, be it S.J.V. Chelvanayakam of the non-violent struggle or V. Pirapaharan of the armed struggle, were not objecting to experiment alternative models without compromising the demand of Tamil sovereignty, which is based on the exercise of the full right to self-determination of the nation of Eezham Tamils. Both of them were open to consider genuine models of federalism that didn’t force the Tamils to abandon their Tamil sovereignty claim and the right to external self-determination. Their approach was that the struggle should create such conditions for either the SL State or third parties to formulate models for negotiations that should first form the necessary political space and a conducive environment to enact a political solution before it becomes eligible for the consideration of the nation of Eezham Tamils. The Tamil political leadership of the past were articulating the principles of the Tamil struggle towards such an environment. Without creating a political space for Eezham Tamils to articulate their genuine aspirations and grievances in a righteous manner, and absolving their responsibilities towards such a task, the SL state and the external parties backing ‘Sri Lanka’ will once more conveniently blame the Tamils for ‘lack of engagement with the South’. Therefore, it is necessary that a council of the people in the North-East righteously articulates the fundamental issues to the South as well as to the external forces. Any move aimed at preparing Tamil proposals should take a serious note on the historical approaches and the underlying principles in order to advance the process without backtracking on the fundamental approach as the hijacked polity of TNA has done after 2009. This declaration was further strengthened by the policy of non-capitulation by the leadership of the LTTE at Mu’l’livaaykkaal. Anyone embarking along the road of preparing a political solution framework would have to bear in mind that they should not get locked into a dialectic process targeting containment of Tamil struggle citing the hijacked polity of the TNA. Instead, their mission should focus on consolidating the definitions, principles and the attitudes that should be adopted by the Tamil polity of future struggle. A geo-political power-base of Tamils needs to be evolved in the Indian Ocean Region Region (IOR) in order to bring the necessary attitudinal change in the outlook of the forces that are intervening to suggest compromise and among the masses in the South entangled in a Colombo-based genocidal system of rule. 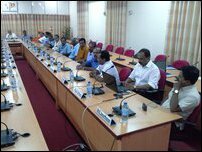 A strategic Pan-Tamil geo-political platform in the IOR will be a source of principled solidarity, when third parties or Colombo opt for compromise on Tamil national democratic rights and sovereignty. In order to negotiate the sovereignty, there should be a conducive and credible political environment. The International Community, asking Tamils to formulate a proposal compromising their own principle within a united ‘Sri Lanka’ would be a trap, which the hijacked polity of the TNA had already fell into by announcing that it had abandoned Tamil independence and the right to external self-determination in its blueprint for political solution and in the election manifestos after 2009. In 2016, Tamils world over would be marking 40 years of the one and only democratic mandate of Eezham Tamils, who exercised their right to self-determination in 1977. The TPC should bear in mind that the vacuum created by the TULF after 1977 forced the Tamils on to a violent struggle. What the TULF abandoned in 1977 with the position of the opposition leader was the creation of an assembly for Eezham Tamils in their homeland. The TPC is taking shape amidst a similar situation in 2015-2016 at an internationalized situation. Articulating the demands targeting the external powers should take precedence over addressing the hijacked personalities of the TNA. Noble values such as those expressed in Vaddukkoaddai Resolution need to be further evolved, not dismissed like the exclusion of Muslims as the TPC has demonstrated in its inception on 19 December. An effort towards organic Tamil unity should accommodate the participation of Tamil speaking Muslims, an alliance which will benefit all Tamil-speaking peoples of the island in safeguarding their respective interests vis a vis each other and in checking Sinhala Buddhist chauvinism of the Colombo establishment. The TPC should also bear in mind that the deviatory section of Tamil National Alliance (TNA) is having a deviatory blueprint in its hands. All the election manifestos of the TNA have come consistently according to that outlook. The main criticism being levelled against the TNA draft is the self-denouncement of the fundamental principle of Tamil sovereignty and the abandoning of full-scale right to self-determination. The TPC should rise to the occasion and prove the fundamentals of Tamil struggle without getting played by the external actors, who have also a tendency of asking Tamils to put forward a blueprint for a political solution framework. 30.07.15 TNA’s draft on constitutional reforms exposes dilution of fu..
06.06.15 Edifying Tamil leadership to face South Africa succeeding No..
31.01.15 Nationhood, Self-Determination non-negotiable: V.T. Thamilma..
14.10.13 NPC culture deviating from secularism of Vaddukkoaddai Resol..
28.11.11 ‘Tamil Sovereignty Cognition Declaration a conceptual refere..
18.10.10 Birth centenary of V. Navaratnam, pioneer of Tamil Eelam pol..
22.02.10 Myth of Sri Lankan state and the historic responsibility of ..
23.09.08 Eezham Thamizh and Tamil Eelam: Understanding the terminolog..